95-1 The MOOSE is pleased to announce Modest Mouse with special guests Talk Demonic in Missoula on Friday, May 27th! Tickets go on sale THIS FRIDAY at 10am. Modest Mouse are an indie-rock band based around songwriter Isaac Brock's Pixies-influenced guitar and philosophical lyrics. After a string of critically-acclaimed singles, EPs, and LPs the band broke out with 2004 single "Float On" and LP Good News For People Who Love Bad News. 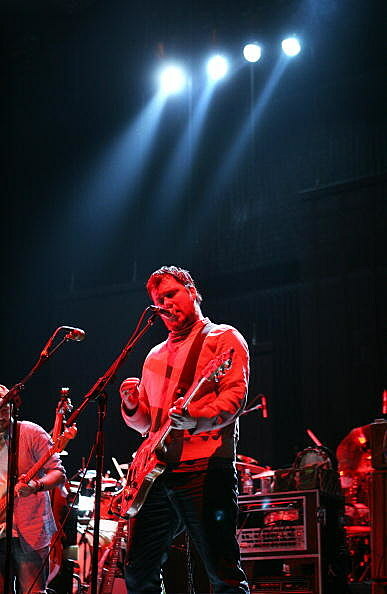 Issaquah, WA, indie rock trio Modest Mouse was formed in 1993 by vocalist/guitarist Isaac Brock, bassist Eric Judy, and drummer Jeremiah Green. After honing their muscular sound in "The Shed" -- a makeshift practice space built by Brock on the land next to his mother's trailer -- Modest Mouse entered Calvin Johnson's Dub Narcotic Studios to cut their 1994 self-titled debut single, released on Johnson's K Records label. Following a move to the Up label, the trio issued two 1996 LPs, This Is a Long Drive for Someone With Nothing to Think About and Interstate 8. After returning to K, Modest Mouse released The Fruit That Ate Itself in 1997; its follow-up from later that year, The Lonesome Crowded West, was the band's breakthrough, and in the wake of a major-label bidding war, they signed to Sony. The rarities collection Building Nothing out of Something appeared on Up in early 2000, followed later that year by their long-awaited Epic debut, The Moon & Antarctica. In 2001, the band issued the Everywhere and His Nasty Parlor Tricks EP and K released Sad Sappy Sucker, a "lost album" that was intended to be the group's full-length debut back in 1994. Brock kept busy with his Ugly Casanova side project, which delivered Sharpen Your Teeth in 2002.